Etsy is one of the most highly visited and recognized online marketplaces for selling handmade jewelry, crafts or art of any kind. I truly cannot say enough wonderful things about this site and once you get the bug you will see why people become addicted. Having had direct experience with a couple of shops of my own I have decided to devote this entire page to this topic alone. At virtually every craft show in which I exhibit I hear customers make comments about Etsy or ask me if they can find my jewelry there. While I do have my jewelry on their site I have not devoted the time that is necessary to build my shop as most of my focus now is on building this website. I have studied Etsy carefully for the past couple of years and have come to the conclusion that their site is nothing short of brilliant. It is truly a work of art in itself. They have taken a slice of life and culture on the internet and created a smaller version of the world wide web especially dedicated to the love of art. Within that world...is a wonderful community of artists, suppliers, crafts people and of course, jewelers. From time to time I come across comments on the internet about Etsy and how hard it is to get sales for jewelry as it is inundated with jewelry shops. Of course like all venues for selling jewelry, whether it be a craft show, a wholesale show, the internet or online marketplaces...it is all inundated with jewelry. Don't let that stop you! If the Beatles had listened to the first advice they received they would have never become "The Beatles." No one would bother to study acting or music if they focused on the competition, only to conclude that it is futile to pursue one's dreams. If you have the desire to create and sell jewelry then you must learn the way to sell it! Just as Etsy has created a smaller world on the internet you will create your own mini world within theirs. Just as it takes time and perseverance to build any business it will take time and concentrated effort to build a successful shop. Like in the "real world" there are checks and balances within the Etsy system. In society we have policing and courts for keeping our world civilized. I find it remarkable that aside from the rules they put forth the whole system seems to be essentially policed by its members. This is done by using the "feedback" system. The feedback system offers, in my opinion, the much needed personal responsibility within the community. Being able to leave feedback as a buyer or a seller... for both buyers and sellers is a powerful way to build trust within the community. No system is flawless and there will always be members who use the "feedback" tool to act out or lash out and typically while saying a lot about the other person they say a great deal about themselves. If used responsibly the feedback system truly builds positive energy and trust. Each one of us that decides to open a shop is then accountable and will likely strive to maintain good relationships within the marketplace. In my experience I have found the experience to be overall a positive one and as for the occasional person that leaks negativity in the form of acting out eventually their reputation precedes them until they stop. ONE - A Top Notch Product - Having a product that is well thought out from design concept to execution to continuity in style is the first step to having an appealing shop. It is better to only have twelve items for sale that reflect a theme or style that says you than it is to have thirty items that are all over the map in terms of design and technique. I have seen shops where it appears that the artist has not decided what their particular style is but, has taken a cross section of what sells on Etsy and dabbled in every medium and style available. This kind of shop tends to look like a mishmash and has no flavour of its own. This is not to say that an eclectic line will not work. There are creative ways to pull this sort of line together with a common thread such as: a photographic style, a technique or distinctive trademark and by making the shop name descriptive of your eclectic offerings. TWO - Excellent Photography - Becoming an expert at photographing your product is probably the most important factor in attracting customers. When photographing your jewelry make sure to keep in mind that natural light is the most flattering and direct sunlight looks unprofessional. Items should be shot up close and kept to a sharp focus and the focal point should be the jewelry, not the background. You are allowed up to five photos of your product and it is beneficial to use them all. Let your customer feel they can get close to the item by photographing your pieces from different angles and on different backgrounds. 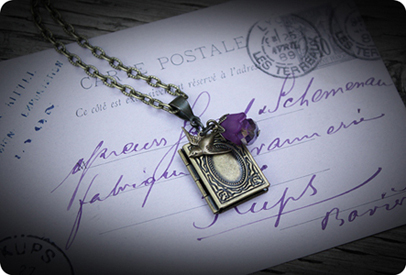 Show your customer how that necklace looks in a romantic setting, draped over an antique book, on a dramatic rich paper and by all means on a human being! By developing a photographic style that is uniquely yours your are essentially branding your line and creating a world for others to escape into. That world should be enticing and offer personal gratification that keeps customers wanting or longing to come back. Make sure to size your photos to Etsy specifications. Shoot your photos at the best quality and crop and re-size your photos as specified. If they are an even square they will appear on Etsy just as you crop them. If they are rectangular they will automatically be cropped when you load them. Although the customers will be able to view the photos in their full size when they click on them you really want the small version to look absolutely impeccable so that customers will want to click on them and go into your shop. Having your photos cropped properly will also increase your chances of having one of your items make it to the front page of Etsy...which is excellent business for you! THREE - Enticing and Clear Descriptions - Be creative with your descriptions. Say a little bit about how you designed the piece, how you constructed it and what it means to you. You could simply share how you envision your jewelry or you could quote a saying or a poem. Sometimes a quote will say a world about the message in a given design. Make sure to include the important specs on each item such as: size, color availability, type of metal, nickel free items, any custom sizing available, whether you can change hooks to clip ons etc. Don't forget to list sizing in both imperial (inches) and metric (centimeters/millimeters). The more the customer can feel satisfied with information the more likely they feel confident to buy. FOUR - Shop Information and Image - When you set up your shop start with a clean shop image by designing a striking shop banner and avatar. If you do not feel you can design the banner of your dreams then find someone who can. There are many designers on Etsy who will do this for a small fee. Make sure that your banner is in focus and easy to read. A blurry banner looks very unprofessional. Before listing any items think about what your shop policies will be and be clear in setting them to print. Make your policies clear but, at all times friendly. People do not feel comfortable purchasing from a shop that has all sorts of warnings regarding shipping and returns. I find it always pays to guarantee my product 100% and let it be known. While I offer refunds it is on the item only and not on the shipping. It is very important to be clear on what your policies are. If you feel unsure look at other shops and find what fits for you. Write a good strong profile about yourself. Let your customer know a little bit about you, your goals, passions and the story of how you started your craft. When people feel closer to you, they feel closer to your product. Lastly, make a shop announcement that is inviting and friendly. This is a great place to say a little bit about your product and any special additions to your line or even how to shop your shop. FIVE - Pricing - While on the average it may be the lower to mid range priced items that sell in greater volume, do not concern yourself too much with pricing your items low. In fact, having low prices just drives the whole market down as other artists feel that it is necessary to compete for low pricing. Although the average sale on Etsy may be low you really must consider that this average is taken from a wide variety of shops. If you look at the top sellers on Etsy there are approximately thirty-three top selling shops before you even reach the first top selling jewelry shop. Out of those thirty-three, twenty-nine of them are craft suppliers and jewelry finding suppliers. Since the top sellers on Etsy are mostly supply shops it is very hard to get an accurate figure for the average sale...especially when the items are in the very low range. They tend to sell more small dollar items which brings the average sale way down. In other words this is not a reflection of what the average sale is for jewelry on Etsy. The list of top sellers is based solely on number of sales. While one shop may be way down the list it could still be reaping in more in annual sales as it is relevant to what the price points are and how much they are selling daily or monthly. What you might want to do is to research all the top selling jewelry shops and find out what the average sale prices are. Again make sure to check how long the shop has been listing items for sale. This is important as one shop may be top selling because they have been on Etsy for five years and have accumulated more sales simply by being around longer while another shop may be selling ten times more per month but have only been open for eight months. In other words do your research in order to access what the price ranges are. After you have done that you need to carefully consider the right price for your product. Do not under sell your work. It is very difficult to increase prices suddenly because you realize you have under priced your work. There are a select few jewelry artists on Etsy who sell their work in the seven hundred dollar range. One particular jewelry designer has developed quite a following and has no problem getting that kind of price for her work. But, bear in mind that the technique, materials and reputation all seem to warrant this price point and not all of us will find the way to achieve that. Another important factor in pricing is what you will charge for shipping. On the average I find shipping prices to be rather low on Etsy. In Canada we do not have the best shipping rates available and funny enough I can ship cheaper to the US than I can across Canada. In my Etsy shop I have put a competitive shipping price that sometimes does not actually cover the shipping cost. I feel it balances out in the end as the overhead is very low for selling on Etsy compared to the high costs incurred when selling at some shows. Offer a lower shipping rate and increase your item price by a couple of dollars to make up for it. This can sometimes be appealing to customers when they are willing to pay the price that is listed for the item and go to check the shipping and find themselves pleasantly surprised by the economical shipping rate. To learn more about shipping from Canada please visit my Shipping from Canada page. You can also offer customers a great deal on shipping if they purchase a second item which is good incentive to buy more. There is often little cost incurred to add a second item to a package especially when that item is a small piece of jewelry. SIX - Networking and Promoting - There are many ways you can promote your shop with some networking and advertising. Consider starting a blog and writing about your product, your process and you. Once people get to know your jewelry they like to get to know a little bit about you and vice verse. Opening a Face book or Twitter account is another way to promote your work and lead customers to your shop. Research the internet for blogs on fashion, style, jewelry and crafts and see if you can submit your work. Sometimes sites will have a giveaway and it may be worth the investment to donate an item in order to get a link to your site. On Etsy there is a section called showcase where, for a small fee, you can promote one of your items. Also consider putting treasuries together on Etsy. A treasury is a group of items selected by members by either color or theme and Etsy puts those treasuries on their front page. The remaining treasuries that do not make it to the front page are available for buyers to view as well. Treasuries consist of items from other shops that you search by keywords. Make sure that you let the other shops know that you put one of there items in your treasury. Give a little...get a little...by creating treasuries with other sellers work sometimes they will create one with yours. While it is not a given that they will, it is all part networking. Lastly, always have business cards to hand out at shows and anywhere that you may travel. Make your card clean and clear showing that you have jewelry and your Etsy site address. SEVEN - Relevancy vs recently listed - It used to be that most recently listed item on Etsy would show up at the top of the pile. So, if you had just listed a necklace your necklace would be near the top of the list as viewers searched on Etsy. With this search system you could have your items viewed several times just based on the number of people who happened to be searching on Etsy at the time you listed your item. Then Etsy introduced relevancy search which means that buyers view items based on their specifec keyword searches. For this reason it is very important to become keyword focused so that buyers will find your products. Keep in mind that at the time that Etsy introduced relevancy search they suggested that at some point they may revert back to the older search system. For now it is best to gear your shop for the relevancy search in order to be found. When items used to be found by "most recently listed" it was worthwhile to re-list (now called copy) or renew items for twenty cents a listing as a way of getting your items back to the top of the search pile. Now there really is no point in re-listing or renewing items as it no longer has any bearing on where in the search pile your item will end up. Your item will be found solely by keyword searches or any kind of networking and promoting that you have in place. The top three ways to get your items found with relevancy search is by titles, keywords and tags and by filling in any fields that Etsy offers for search help. Your product description will not help the buyers find you but, will help once they have found you. Let's start with the title. Your product title should include relavent information such as: Swarovski Indian Sapphire or Art Nouveau if that is what your buyer might search for. Naming your title Sophia necklace will not help buyers to find you if they are looking for a sapphire necklace, even if Sophia is made with sapphire crystals. If you wanted to include the name of the necklace you would be better to put sapphire necklace followed by sophia. As much as possible give your title keywords that are being searched on Etsy. Do some research with the etsy toolbar for handmade items and make notes on which keyword come up as suggestions when you start to enter keywords related to the item you want to list. For example: if you would like to list a vintage necklace that has an old hollywood feel use the exact keywords that come up as a suggestion in the etsy search bar. You will see that "old hollywood necklace" is a popular searched keyword. Next, use as many tags as you have available with related keywords. Whenever possible use them all! I once listed a vintage glass German cameo in my Etsy supply shop and my listing came up quite high on the internet when doing a search. Now, I am not talking about how it ranked on Etsy I am talking about the whole internet world. I find that remarkable when you consider the millions of sites on the net. So, yes use all the keywords you can and consider them carefully. If your jewelry is nickel free add that keyword and most important do not forget to list the color as a keyword. French blue, bridal, one of a kind, lead free, women, mother's day, wedding, aquamarine, semi precious, black onyx, crimson, mother of pearl, vintage style, antique finish, retro, mod, kitsch, sterling silver, patina, re purposed, estate style, modern, contemporary, bridesmaids, swarovski crystal, freshwater pearl, periwinkle, olive green, cameo hoops, eclectic etc. Don't forget when listing colors to include the basic names such as green as well as chartreuse. EIGHT - Image title - Although I have not comfirmed this to apply to Etsy I believe it is always good practice to name your photos with keyword titles in order for the search engines to find your images. When you take photographs your images will probably be labelled something like 1093.jpg. This number is simply the sequence number of the photos you take as you take them. Make sure to re-name your images with appropriate keywords such as: aquamarine swarovski ring. Google is much more likely to find your item on the internet with a keyword title attached to the photo. This way as buyers search on the internet for an aquamarine swarovski ring they may very well find that ring in google images. Then they are just a click away from finding your shop. Make sure that the title on your Etsy listing also matches the title on the photo...more or less. I have noticed that google images do turn up items from Etsy all the time but the photo titles seem to be converted to a number even when they have related keywords. For this reason it is important to keep a good listing title as well as a photo title on Etsy. On my regular website google images turns up photos of my jewelry from my website and they show the title I attached to the photo. On Etsy google images turns up photos of my jewelry from my Etsy shop but, the photo title is in a code and the item seems to show more related to the listing title than the photo name. None the less, it is always better to have a name that relates to the product you are listing than to have a meaningless photo number. NINE - Customer Service - Excellent customer service is one of the best things you can do to create trust and a loyal following. Offering guarantees on your work and a quality product will keep your customers coming back. From the start you can offer great service by simply replying to emails quickly and shipping orders promptly. Showing appreciation to your customers for simply looking and inquiring about your work as well as when they actually make a purchase goes a long way. Have you ever purchased from someone and you are the only one to say thank you? Does it leave you thinking as you walk away what happened to thanking the customer? Sometimes it is a matter of not being conscious of expressing appreciation and sometimes it is a matter of the wrong attitude as in you are "lucky to have me serve you" but...why leave your customer guessing. Let them know they are valued. Packaging your product in such a way that says you are taking great care in sending their purchase and you take pride in your work leaves a customer with a good feeling about you and your product. On Etsy it is quite customary to send jewelry gift boxed. In Canada that extra few millimeter thickness to the package drives the postal fee way up. It's crazy but a gift box within Canada can add several dollars to shipping. On my website I offer two shipping fees: express service that is more expensive and will accomodate a box or an economical rate that includes the item carefully packaged in a pretty organza bag. Etsy does not have as many options as a personalized website does. Depending on where you live and what your postal rates are you can determine what your shipping fees are and what kind of packaging that will include. Often shops will include a photo of how the product is packaged so that there are no surprises when it arrives. It might be very disappointing to receive a piece of jewelry in tissue paper when all the other shops send boxes with bows. These are all important considerations in adding appeal to your overall presentation and creating a special feel for your customers. Good customer service leads to good customer feedback and it is all part and parcel of building trust online. TEN - Do Your Research - If you want to learn how to sell on Etsy successfully take a little time and do your research. Use the tools available on Etsy to see what other shops are selling and how they present themselves. If there are fifty shops selling tile image pendants then it is probably not a good idea to sell tile pendants. There truly is no way to compete with a trend at the end of its cycle. More so you are a creative person who can come up with many fabulous ideas. If you already have an established line it will probably be much easier for you to decide which items you will list but, if you are looking to cater to trends then research is your best tool. There are some designers who sell less items at higher price points and some who sell high volume low priced items. Sometimes shop owners suddenly find themselves working like a little factory if their product takes off while others cannot understand why they are not selling. None the less it is important to plan and know what you are getting into. If your low priced items will sell like hot cakes it is good to be prepared mentally by making a concious choice about what you would like and what your vision is. Now that we have talked about research let's go ahead and learn how to analyze a shop.